For my layout plugin I am experimenting with automatic correction of some Finale spacing issues. Example image 1 is Finale's default output (Problem: the second unison note is not taken into account with accidental collision and is too close to the first unison note). Image 2 is what my plugin created. In image 3 additional space was added before the last note and between the unison notes, but no "overall" spacing correction was made. Do you consider the solution 2 as good practice? I.e. the 2nd note in the top staff is shifted slightly to right to better see the 3/4 feeling. 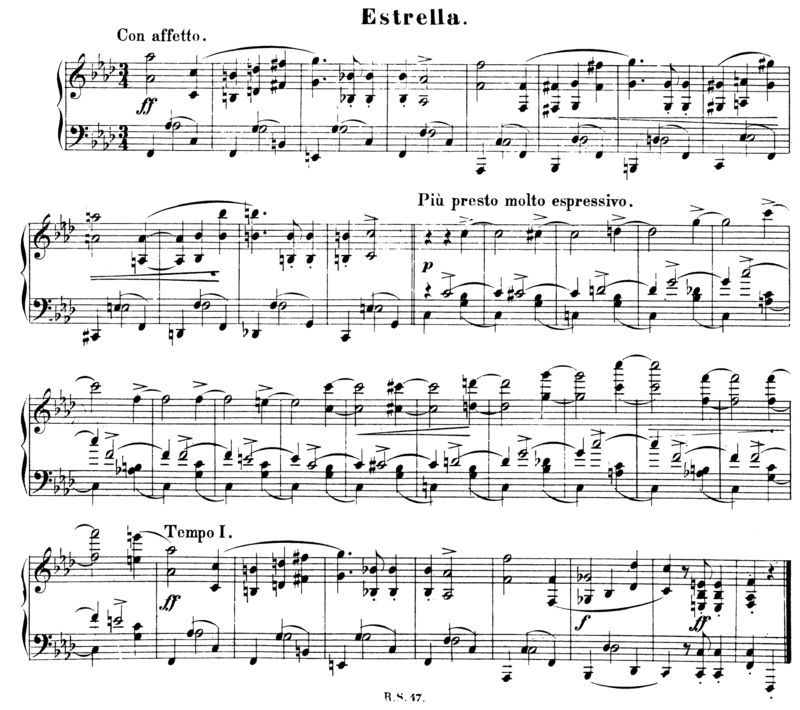 The original Estrella engraving uses this approach quite often (e.g. m. 2, 8, 10, ...). Actually only in m.6 the stems are aligned. Gould recommends (in general) alignment with the stems - like in image 3 though probably with a better overall spacing. Last edited by jan on 18 Aug 2017, 11:01, edited 4 times in total. The original Estrella engraving uses a this approach quite often. Gould recommends (in general) alignment with the stems (i.e. image 3). That's a great idea for a plug-in! Finale also has trouble in much the same way when spacing seconds (or any offset notes, really), which might be something you would want to consider incorporating into the same plugin. Anyway, first things first. Under tight conditions, sure, but I would try to maintain only a subtle misalignment between the staves if at all possible. The instances in the beginning of the Stella showcases this very well; here the extra space needed for the offset half note is distributed across all three beats, keeping the quarter notes on beat 2 more or less aligned without distorting the spacing. The instances in the last system are less subtle and more similar to your second solution. There doesn't seem to be any good reason for it, other than more sloppy work, but there will inevitably be cases where there is no way around making the apparent offset more elaborate. Whatever the situation may be, the trick is to make good use of any available space in the measure to minimize the effect as much as possible. With all that said, taking the entire measure into account like this is perhaps more complicated than what a plug-in can handle, in which case your solution is at least much better than both alternatives. A vote for example 3 with the right hand evened out. The half note is a secondary voice that shouldn't be involved in the spacing. Maybe I'm misunderstanding you, John, but isn't that what's done in example 2? Sorry, Knut, I edited the last post down to the point where it is cryptic. The stems of the quarter notes don't appear in line with each other in example 2; I think they should be. I think that is standard practice and what the engraver was trying to accomplish in the original example, but eye-balled it rather than using a ruler. Here is the solution that John was referring to (I think). I edited the beat chart for 2nd AND 3rd note. It's much more difficult to get good results like this, but it looks better than image 3. I see. Then it appears our Ideals are identical. This is basically what I meant as well. Whenever there isn't an abundance of space in a measure, you would distribute the extra space needed for the half note (offset space) across all beats, i.e., space for beat 2 (including the offset half note) is decreased by 2/3 of the offset space, while space is increased by 1/3 of the offset space for beats 1 and 3. This keeps all beats evenly spaced and all quarter notes lined up. Yes, the final last example looks fine to me. I am looking forward to trying out your plugin, jan!